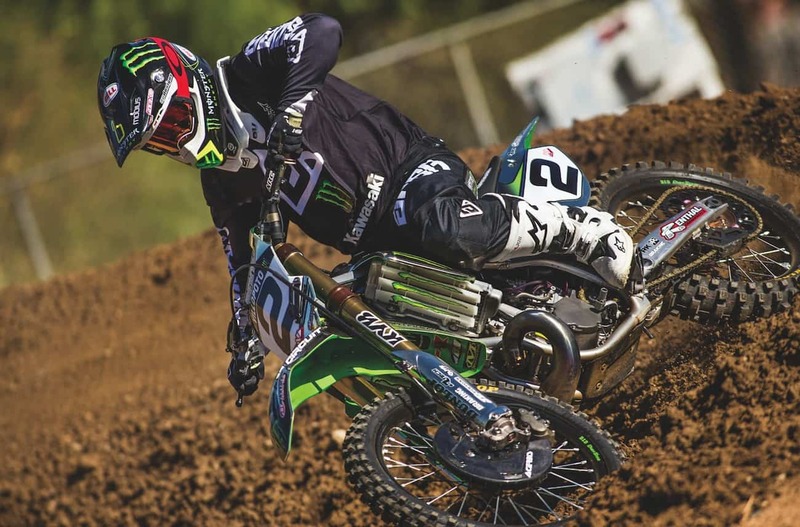 Years down the road people are going to look back and call Ryan Villopoto a legend of the sport. There is no doubt that Ryan’s 10 motocross and Supercross championships, combined with his 73 AMA overall wins, will be something riders respect and people talk about for decades to come. Ryan was a racer loyal to his sponsors. His entire racing career, even in the Amateur ranks, Ryan raced Kawasakis and wore Thor Racing gear. After his retirement in 2015 at 26 years old, Ryan fell off the industry map for a few years. Ryan mentioned his time away as “needing to recharge the batteries.” He and his family packed their bags in their SoCal abode and moved back to Washington where he grew up. It didn’t take long before Ryan realized his roots were deeper within the industry than where he lived. Bones helps Ryan Villopoto with the set-up. So, Ryan, his wife Kristen and his young twin boys decided it was time to move back to California and become part of the industry once again. But this time, Ryan would play a different role. Being a championship racer is a stressful life to lead to say the least. Ryan wanted to be involved in the industry, but on his own terms so that he could keep it fun and enjoyable. The once racer is now on the consumer side of things as a spokesperson for companies he believes in and a role model to young riders. In this transition Ryan partnered with Answer Racing as their brand ambassador. For Ryan to make a big bang back into the industry, he decided to race his 2005 Kawasaki SR250 at the Red Bull Straight Rhythm. The bike was a gift from Kawasaki. Although it wasn’t as easy as it sounds to race a 13-year-old two-stroke. The bike had been sitting for several years up in Washington without being started. It had outdoor suspension and needed some serious TLC. Ryan called Mitch Payton to see if Pro Circuit could get the bike turned around and ready in time to race the Straight Rhythm. Sorry about that Ryan! It wouldn’t be an MXA test without a big crash. The hardest part about getting this bike ready to race was finding suspension parts for works components that technically didn’t exist. It’s easier to get new works forks than the pieces needed to bring a decade-old works forks up to snuff. The factory Kayaba forks on the SR250 were only made for Kawasaki’s factory riders back in 2005. That meant that only James Stewart’s and Michael Byrne’s factory SR250s had these forks on them. Like most factory bikes, after factory parts get antiquated, they are usually crushed. This led Pro Circuit’s Bones Bacon on a treasure hunt to get the pieces needed to make these large-diameter Kayaba forks Supercross-stiff. After a few calls to Kayaba, Bones was able to scrounge up the parts to make them work. BEFORE THE 2005 SUPERCROSS SEASON STARTED AND HIS SR250 WAS SITTING IDLE. SR stands for “Special Racer” in Kawasaki alphabetized lingo. What makes this bike so special? Factory parts. And lots of them. Ryan’s SR250 is littered with one-off factory parts. 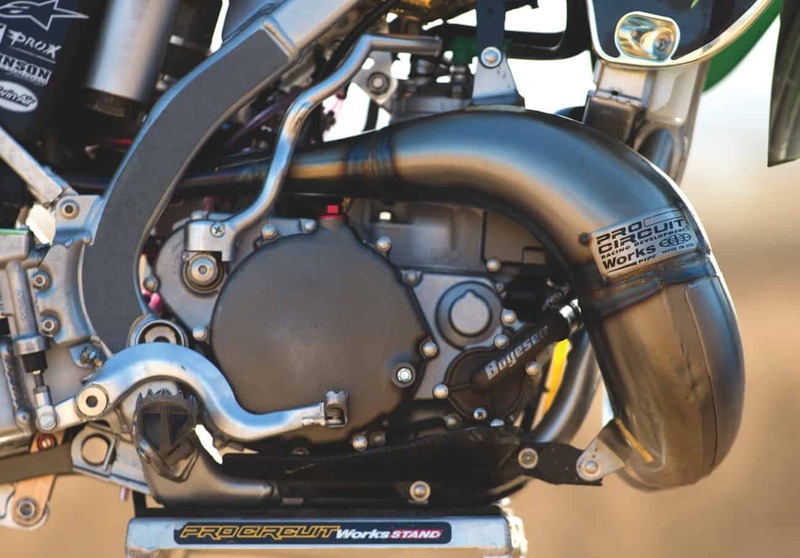 Mitch told us that the engine came directly out of James Stewart’s SR250 from the 2005 season. That got us thinking. 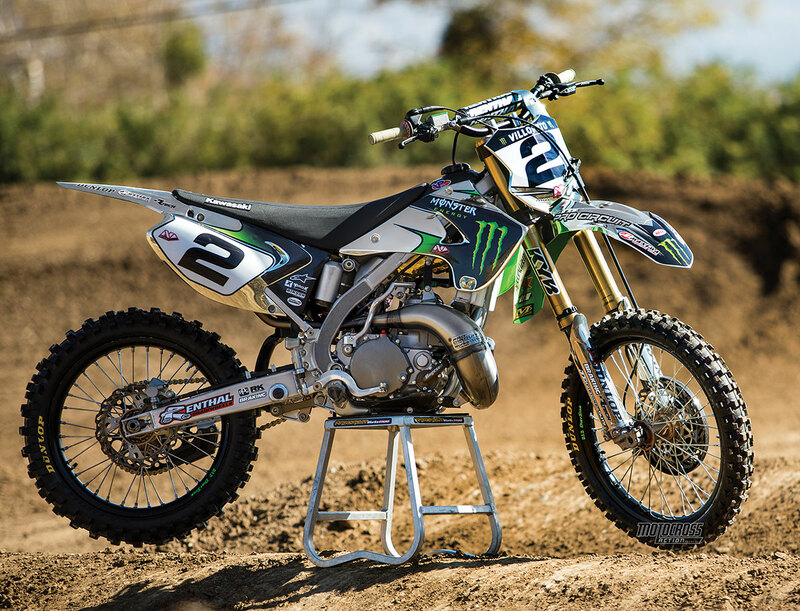 MXA tested James Stewart’s 2005 SR250. James had broken his arm just seven days before the 2005 Supercross season started and his SR250 was sitting idle. We asked Kawasaki to give it to us, and they did. Looking back at James’ and Ryan’s SR250s, we couldn’t help but notice how many of the parts were identical. Could this be James’ full SR250 from back when? Mitch, Bones or Ryan did not know for sure, but it probably is. 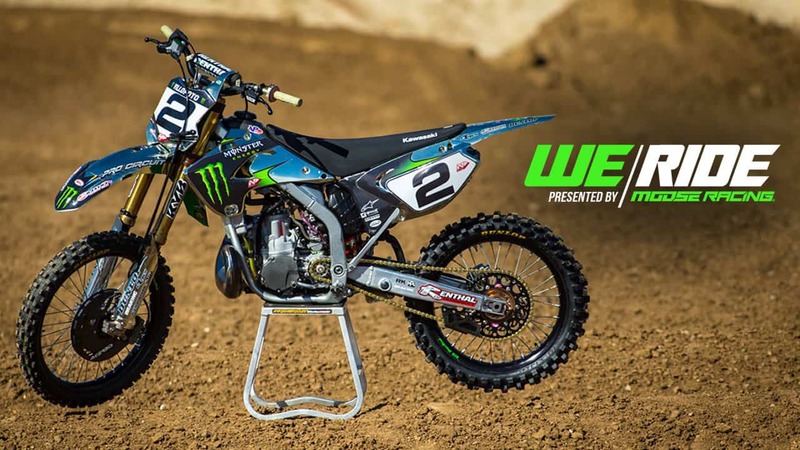 After Ryan raced this bike at the Straight Rhythm, we asked him if we could test it. Ryan agreed on the spot, but he said that we needed to get Mitch’s approval as well. Mitch said that we could have Ryan’s SR250 for one day and one day only—and that he would have Ryan Villopoto come with the bike. Ryan and Bones met us at Glen Helen on a Wednesday to ride the bike. Ryan got dressed and mounted the SR250 first to ensure that the old dog was primed and ready to go. 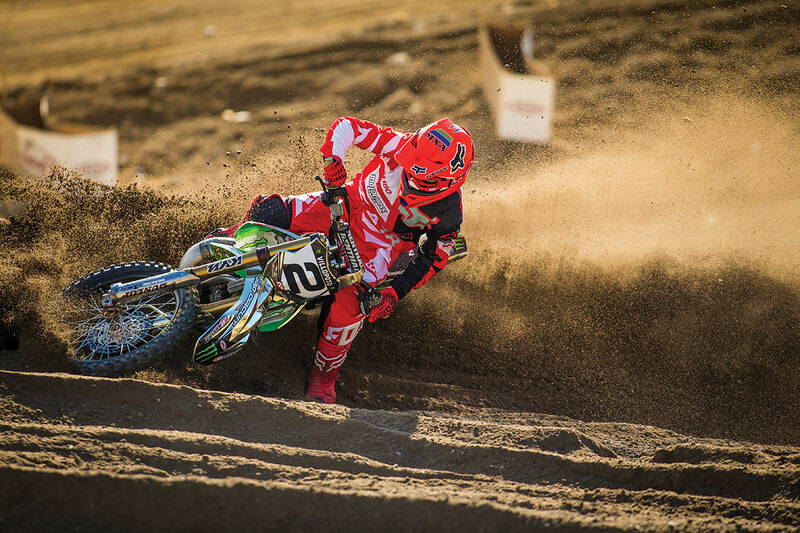 He spun laps on the Pro Circuit Supercross track, which is located left of the Glen Helen Talladega first corner. The bike sounded nice and crisp, and we were all eager to ride it. We kept the MXA test riders on the Glen Helen outdoor track to keep them from running out of talent before the Pro Circuit test track ran out of whoops. Although the suspension was set up for Supercross, the faster we went on the outdoor track, the better it was. It was, of course, stiff, but once we broke through the first few inches of travel, the suspension was plush and progressive. Even Ryan was surprised how well the bike handled on the outdoor track. 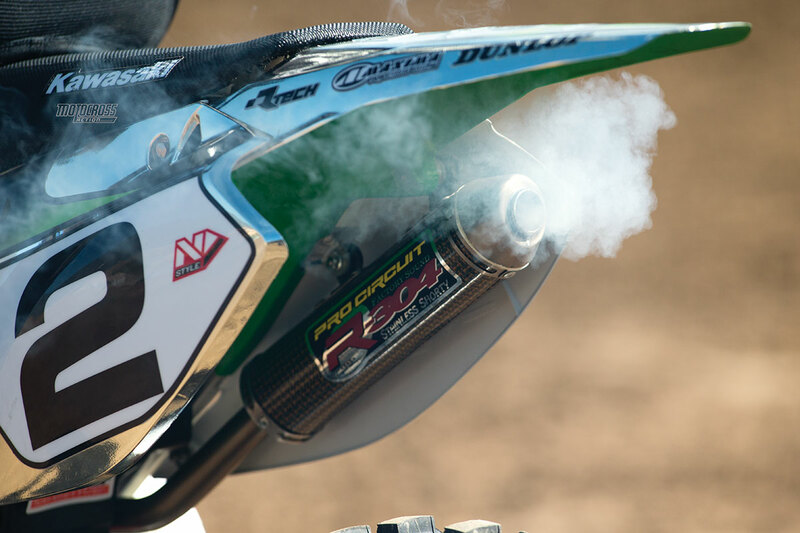 Pro Circuit’s R-304 carbon fiber silencer purred like a kitten on Ryan’s factory SR250. We miss the sound of factory two-strokes at the races. If anyone remembers the 2005 Kawasaki KX250, it was a horrible-handling bike. It didn’t turn, the rear end was all over the place and the powerband was all top-end. Ryan’s SR250 didn’t have any of those qualities. His SR250 tracked great into the corners, laid over well, tracked through the apex and exited with precision. The rear end was planted and tracked with the front. The characteristics of the production bike and the works bike couldn’t have been more different. The benefit of having the unlimited resources of a factory team is that you can fix just about anything. The factory Kayaba forks have been discontinued for years now. Bones Bacon had to go on a treasure hunt to find parts to update the settings. You have to remember, this engine is 13 years old and based on the best knowledge available from more than a decade ago. It is often said that factory technology is about five years ahead of production bikes, so let’s call the SR250 8 years old. However you slice it, Ryan’s SR250 put the power to the ground with a classic two-stroke delivery that was surprisingly easy to ride. It was lacking the modern bottom end of a 450 four-stroke Supercross bike, as Ryan commented, but as an outdoor bike it pulled hard and long on the big hills and straights of Glen Helen. To compare, this engine didn’t have the hit of the new-age KTM 250SX, but it killed it on the top-end and over-rev front. 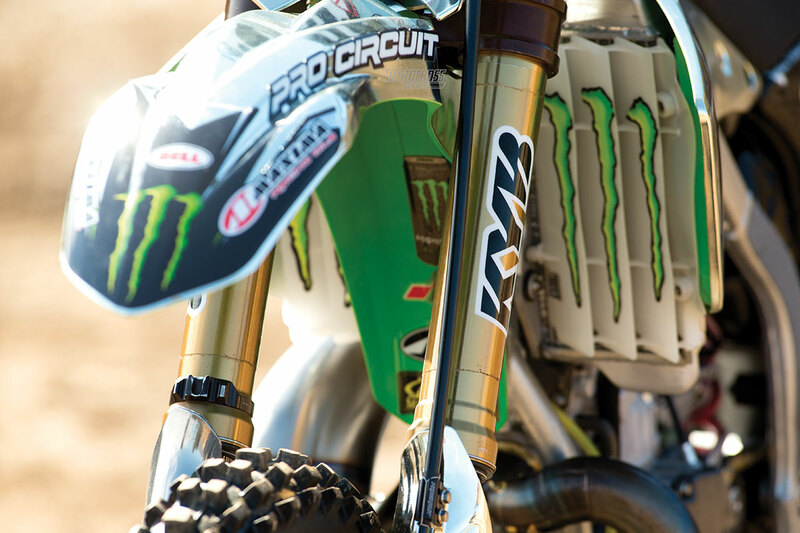 Although this was a 2005 Supercross engine, it felt like an outdoor engine more than a Supercross powerplant. Heck, maybe this was James’ 2005 outdoor engine. It sure felt like it, but no one will ever know, as its designation has been lost in time. 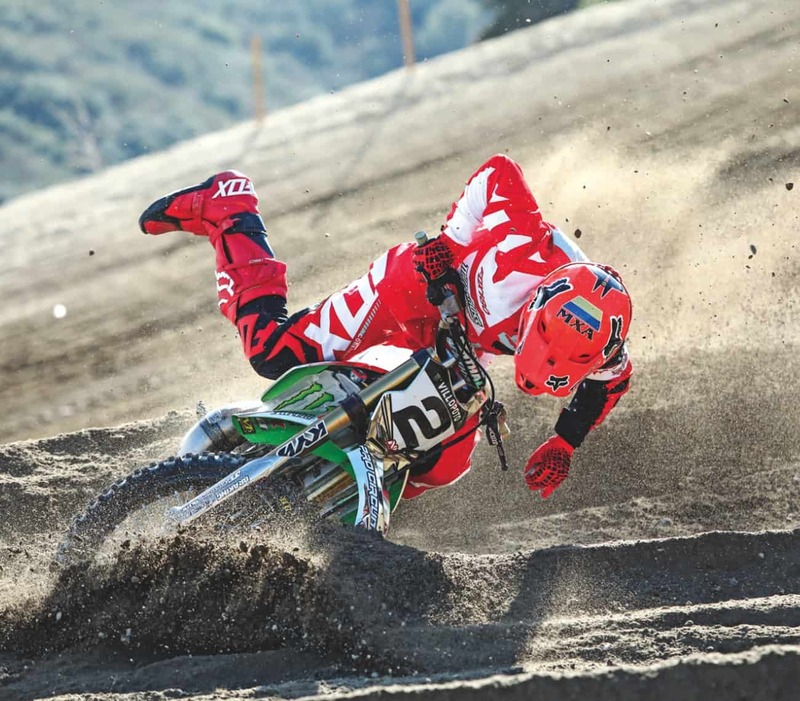 Ryan Villopoto came with us when we tested his Kawasaki two-stroke and spun a bunch of laps on the Pro Circuit Supercross track—which is at Glen Helen. 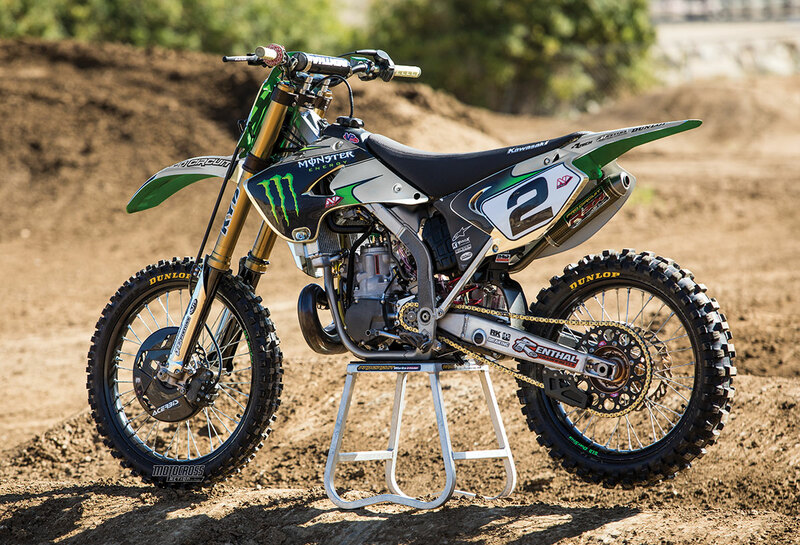 Overall, Ryan Villopoto’s Kawasaki SR250 bike was a blast to ride—unlike our experience with the production 2005 KX250. It also felt like we were riding a piece of history. This bike has nostalgia written all over it. It should be sitting in a museum somewhere with a sign that says, “Do not sit on it.” Luckily, Ryan Villopoto wanted to get it dirty. Thanks, Ryan, for letting us ride your piece of history. It was one heck of a ride.